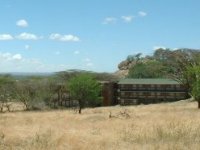 Set amid rocky outcrops or ‘kopjes’ as they are called locally, which are geological features of the Serengeti, Mbuzi Mawe tented camp is in the heart of the Serengeti National Park, half way between Seronera and Lobo, in a low use area of the park. The camp consists of 16 uniquely appointed luxury guest tents each with their own en suite facilities and private veranda. Tents are decorated in a true African luxury style with mosquito nets and four poster beds and his and hers bathrooms. Activities at Mbuzi Mawe include daily game drives where, with the aid of your guide, you will have the opportunity to experience and appreciate first hand the harshness and beauty of this area. Balloon flights and sundowner cocktails can be arranged. The name Serengeti comes from the Maasai word 'siringet' meaning 'endless plain' and at Migration Camp one experiences the vastness of the sweeping plains. The Serengeti migration masses around the site for several months en route to the southern plains with excellent sightings of lion, leopard, elephant and buffalo year round. The camp is uniquely set in the northern central Serengeti, overlooking the Grumeti River, and offers 13 secluded luxury tents with full bathroom facilities for the discerning traveler. Spectacular sunsets, open air dining, roaring log fires and star studded night skies reflect the romance of East Africa. To the edge of the Kuka Hills, Klein’s Camp stands with excellent views of the valley. 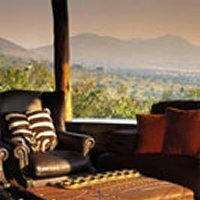 The camp contains ten intimate en suite cottages of local rock and thatch with wooden floors and classic interiors. From each private terrace, a diversity of wildlife may be viewed in the valley. 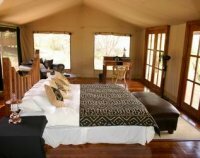 The main camp has a large, beautifully furnished bar/living area, plunge pool, curio shop and leisure deck. The restaurant and lounge command spectacular views of the valley and surrounding hills. Pan African dinners can be enjoyed around an open fireplace or in a bush clearing and private dinners can also be arranged for a romantic setting. Askaris (Maasai warrior guards) accompany you to and from your cottage at night. Bush breakfasts at spectacular locations are a specialty. Private dinners are arranged at request. Day and night safaris in open vehicles are led by experienced rangers and guides and offer a thrilling experience spotting elephant, the black eagle and other wildlife. Enjoy spectacular sundowners with views all the way across the northern Serengeti, and set the mood for sumptuous, intimate evening meals. Klein’s camp is ideal for honeymooners. Lemala Luxury Camp Serengeti is a semi-permanent camp which follows the migration route. There are only 8 tents in the private concession to ensure privacy and seclusion. From June to October Lemala Serengeti Camp sits on a large kopje overlooking the plains of Northern Serengeti. The Wildebeest migration starts arriving in the area from June onwards and heads towards the Mara river only a few minutes from the camp. The migration river crossings of Masai Mara can be observed and are spectacular. Large number of herds remain on the Serengeti side even when the migration spills into the Masai Mara and guests continue to enjoy excellent game viewing away from the crowds up to November. Nestled within the Serengeti National Park in Tanzania, in the vicinity of the great annual migration, the Bilila Lodge Kempinski is a dream African hideaway offering spectacular views of wildlife roaming over miles of bush, an active water hole and the magical sunsets of the African savannah. All of its 74 rooms, suites and villas feature luxurious en-suit bathrooms and decorated with handpicked African artwork. 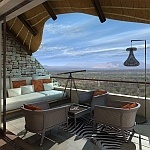 The lodge facilities include a restaurant, lobby lounge, bar, boma, wine cellar, art gallery and gift shop. The infinity pool and Anantara Spa provide for the ultimate relaxation after an exciting day of a game drive.